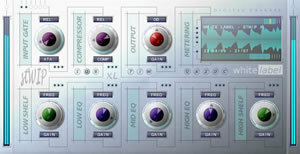 whiteLABEL stWIP, Other Effect Plug-in from Rough Diamond Productions. 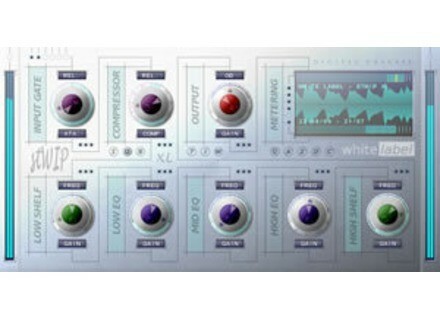 Rough Diamond Productions has announced the release of whiteLABEL stWIP, a Digital Channel plug-in designed to be used for compression, gating, distortion, EQ or limiting. Each Filter and EQ band is designed to deliver up to 30 decibels of cut or gain and the 10 cross mixed dynamics modes range from light compression to heavy companding. A distortion unit can further boost (and / or destroy) your signal and a hard-limiter on the output keeps things under control. stWIPFully Specified: From a single mono input to a full 5.1 surround mix, stWIP automatically switches to the configuration of your choosing. Whenever a channel input falls silent the channel goes to sleep (reducing CPU use) and whenever a section is un-used it too enters sleep mode so you can use your CPU cycles on some other aspect of your project. Intuitive Control: As well as text-input of major settings, control elements respond to a set of [<key> + click] commands to set control positions, toggle individual sections, and copy and paste between patches. 5 keyboard layouts are supported for international users - QWERTY, AZERTY, QWERTZ, DVORAK & COLEMAC - once set, stWIP remembers the layout so the control modifier keys are in the same position under the hand regardless of physical keyboard layout. Mute Ability: Each and any of stWIP's channels (up to 6) can be individually muted (unless a channel is asleep) and the tall bright VU meters (input & output) give an indication of levels - expressed as either linear or non-linear scale (double-clicking the meters changes mode). When the input configuration changes the meters switch to show only the number of channels in use - for example, when using stWIP on a QUAD mix and panning the input to just the front pair of speakers, the VU meters reconfigure themselves to 2-channel mode giving a clearer view of only the channels currently in use. stWIP(FULL) has 2 channels and can be used on mono or stereo tracks / groups / sends / busses. stWIP(XL) [the bigger brother] has 6 channels and can be used on mono, stereo, quad and surround parts - any combination up to 6 channels wide. In addition, a 3rd version, stWIP(FREE), can be used on mono or stereo tracks but lacks MIDI and automation support. Despite the slight reduction in functionality (and nag-screen) it features the same algorithms and has the same look and feel, according to RDP. Access Music Releases Virus TI OS v3.1.0.0 Access Music has announced the availability of OS v3.1.0.0 for the entire Virus TI range of synthesizers. AcmeBarGig Gimme Head Today AcmeBarGig has completed "Preampus Week" with Gimme Head, the final release from its Classic Hybrid line of free amp VST effect plug-ins for Windows. Native Instruments Scarbee Pre-Bass Native Instruments introduced Scarbee Pre-Bass, a new software instrument designed to provide a musical rendition of the iconic Fender Precision bass.